The web seems to be the biggest existing information repository. The extraction of information from this repository has attracted the interest of many researchers, who have developed intelligent algorithms (wrappers) able to extract structured syntactic information automatically. 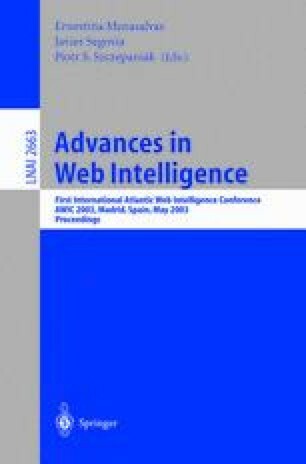 In this article, we formalise a new solution in order to extract knowledge from today’s non-semantic web. It is novel in that it associates semantics with the information extracted, which improves agent interoperability; furthermore, it achieves to delegate the knowledge extraction procedure to specialist agents, easing software development and promoting software reuse and maintainability. The work reported in this article was supported by the Spanish Interministerial Commission on Science and Technology under grants TIC2000-1106-C02-01 and FIT-150100-2001-78. D. Brickley and R.V. Guha. Resource description framework schema specification 1.0. Technical Report http://www.w3.org/TR/2000/CR-rdf-schema-20000327, W3C Consortium, March 2000. I. Horrocks, P.F. Patel-Schneider, and F. van Harmelen. Reviewing the design of DAML+OIL: An ontology language for the semantic web. Technical Report http://www.daml.org, Defense Advanced Research Projects Agency, 2002.